HyQ2 is a quadruped that has been in high focus at the Italian Institute of Technology's Dynamic Legged Systems lab. They have been getting it disaster-ready for search and rescue missions and for environment disasters. This DLS lab performs research and development on high-performance, versatile legged robots. The Lab's notes say that their torque-controlled hydraulic quadruped robot HyQ is their flagship platform. The HyQ robot was developed at the IIT in Genoa. The lab works on achieving accurate hydraulic force/torque control at the joint level. They explore a variety of different locomotion gaits, strong enough to withstand external disturbances and changing environmental conditions. As important, "a significant part of our groups' effort is devoted to perception tailored to dynamic quadrupedal robots. This becomes important as robots take their first steps outside controlled lab environments and into real-life applications." Prof. Jonas Buchli of ETH Zurich appeared in the November video; he said the goal was to have a robot that can go out to work in places that are not known to the robot yet the robot can succeed in doing something useful. Such tasks could include sending HyQ or a version of it instead of humans to radiation sites. An ETH Zurich team has been developing algorithms to maximize HyQ's full potential, according to the November video. Updating their work, Matthew Stock of Reuters reported Tuesday that the HyQ2Max is now the latest and most powerful four-legged robot to come out of the Italian Institute of Technology (IIT). HyQ2Max, as the name suggests, is an improved version of their hydraulic quadruped robot HyQ. Stock said "HyQ2Max's main designer was mechanical design engineer Jake Goldsmith who made its torso from aerospace-grade aluminum alloy, with lightweight fiberglass and Kevlar covers protecting the onboard computer." The robot's sensitive parts— sensors, valves, actuators and electronics— are protected inside the structure. What's next? 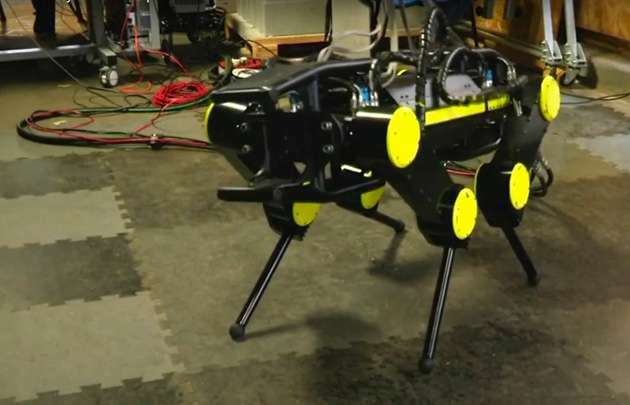 "Ultimately the team believes quadruped robots operating in real-world applications will need to manipulate objects at some point. They are working on a pair of dexterous arms," said Reuters, "that will be mounted on the front of HyQ2Max and other IIT quadrupeds. This 'centaur-style' robot would combine the advantages of a stable four-legged base with the ability to handle objects." How many hi-tech scam and erroneous claims have come out of groups looking for funds. Take note that this robot while they say are putting advanced end effector on it is shown on a flat surface and under very controlled conditions. The robot has about as much chance working in a hazard site as giving rise to spontaneous consciousness.